The Skinny: An enjoyable flick for all ages. Those who care little for the trials of aging Chinese singers should probably look elsewhere, but most grandparents will be happy to watch this movie with you. 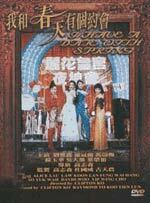 by Kozo: This acclaimed and popular feel-good flick from Clifton Ko and Raymond To is a decent, if somewhat slight charmer chronicling the lives of four nightclub singers over two decades. The film takes place primarily during the sixties, and relates their stories via flashback. Alice Lau plays the primary singer, who actually made it big but had to give up her best love (David "Wu-Man" Wu) in the process. Needless to say, this causes the lion's share of her current regret. Law Koon-Lan, Fung Wai-Hung and So Yuk-Wah play the pals.